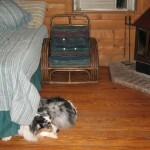 After a brief rest and lunch at our little cabin at FoxFire Cabins, we decided to make a drive around the area. This decision was spurred by his need for painkillers for a backache, none of which we had. I had read in the cabin’s journal (I LOVE how cabins like this leave a journal for people to write their experience in. Reading these journals is always how I end up spending our leisure time) that the best place to go for gas and pharmacy needs was Leakey, a town about thirty minutes away over the hills. 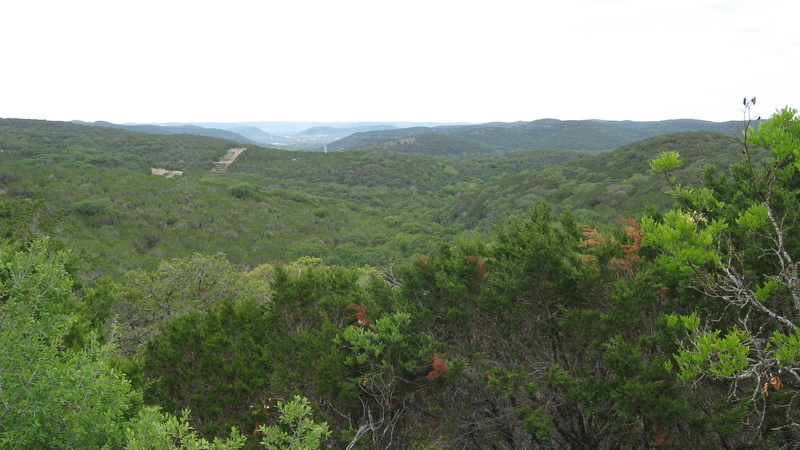 As it turns out, we didn’t make it that far without getting distracted by a geocache (GC2RBDW, or “Hummingbird Haven in Lost Maples”) that also had two bonus features: it was located near several hummingbird feeders that were very active, and near a general store, albeit more pricey than buying Ibubrofen in Leakey. J stayed outside with his camera and tried to get pictures of the 5-6 different types of hummingbirds around the feeders, but the pictures didn’t turn out that good. We really need to win the lotto or make some good bank to buy this guy a decent lens for the camera. The cache was a quick and easy find, although of course I made it take longer than it should have. 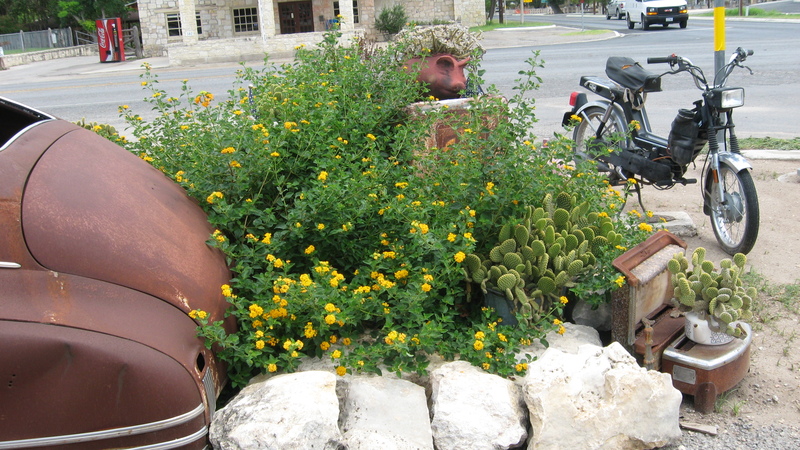 After this, we headed out in earnest, west along 337 to Leakey, geocaching along the way. Several of the caches we stopped at went like this: park along the shoulder on a pull out, walk a short distance up a rise in a hill along a fenceline, find a small cache, sign your name, and look at the view. Take a picture if you remembered the camera. Here is my obligatory “I can see for miles and miles” picture. 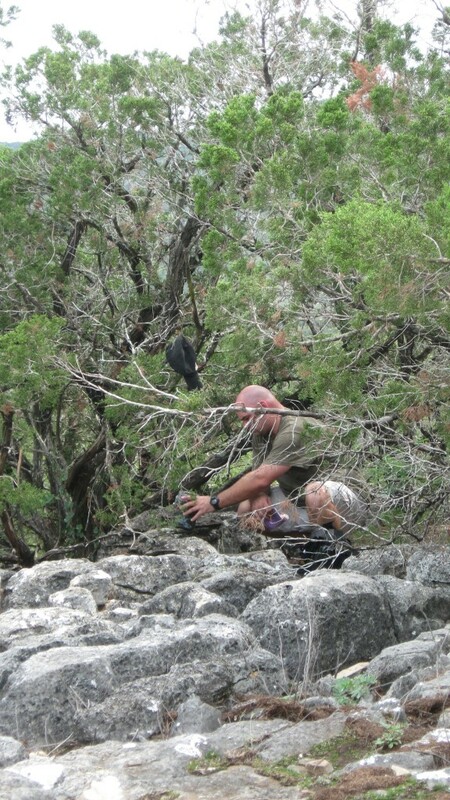 When we got into Leakey, we experienced a little bit of caching frustration. We had stopped to find one that seemed to not match the hint and be on some form of private property, turns out the coordinates were like 1000 ft off and the cache was actually two blocks away, how annoying. On this annoyance, and on a quest for gas stations and other interesting diversions, we came into the main intersection in town and immediately got distracted by the prospect of interesting wood working and sausages on a stick. We had stopped to find a cache at this location featured in this photo, at a place called the Hog Pen, and the smell of meat slowly cooking in a pit was too much for us, although it had only been a couple of hours since our peanut butter and jelly time. He ordered the sausage, and I could not resist trying their boudin balls, although he commented later, and now I agree with him, that they always look and sound interesting but really, they aren’t that good. While we were waiting for the food to cook (apparently the balls needed to be warmed up), we walked the dogs across the street to Catahoula Woodworks, where we each took turns going in to look at the shop, and the shop owners took turns coming out to pet our dogs. After, or as we, ate our naughty snacks, we found a cool quick geocache over by a popular bikers’ hangout. Apparently this area caters to their tourist niche – motorcycle enthusiasts who call this area we stopped at “The Three Sisters“, for the three roads around here that offer spectacular rides. It’s actually been voted #1 ride by Ride Texas Magazine. 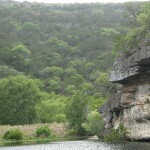 We put gas in the truck here in Leakey, then headed south, to Garner State Park. 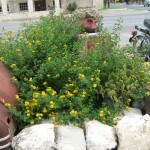 Here, our mission was to get a second leg on our TPWD Geocache Challenge Passport by finding the special cache here. We used our state parks pass to get our day admission (during which ANOTHER park ranger flirted with my man, I swear they all want him. This turned into a long standing joke about “mounted park rangers” that has amused us for some time) and then headed down to the main parking lot by a visitors center and camping area to access the Wild Horse Creek Trail. Our TWPD geocache find was 0.20 miles up this “moderate” trail. Nice, quick, fun, easy. 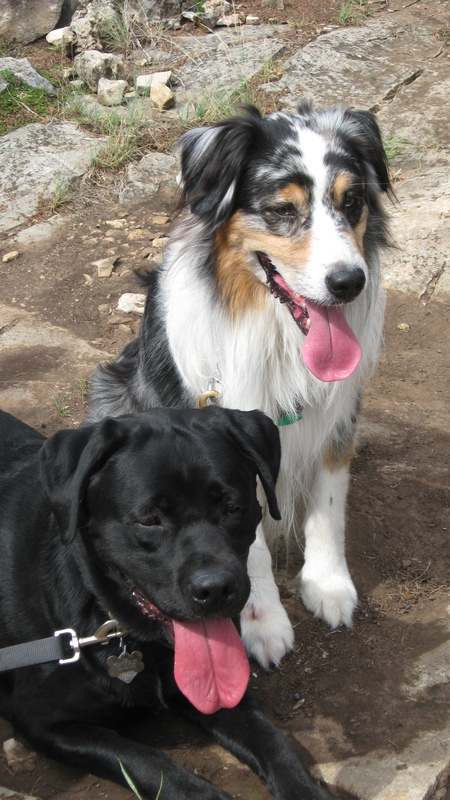 But then, we both wanted to hike more, so when he suggested we continue another 0.20 to another cache, sure! What neither of us realized, I guess, because we didn’t have a park map with us, was that in order to get to this other cache, we were going to have to continue to the end of the Wild Horse Creek Trail (about 0.48), then turn left on the Foshee Trail, which was not a moderate trail, and especially not at this intersection, but a “difficult” trail. That trail kicked our butts! It was steep, with loose rocks, and a heck of a climb for us lowlanders. We stopped to catch our breath several times there towards the end. But finally, we reached “Diane’s Patio”, and the cache we were looking for. Here are some photos of that hike. Story to be continued later, kids are awake and whiny. We had one weekend left until the children came back from vacation with their father, and we had opted to sneak out of town for one last romantic adventure until we were a family of four, and not just the two of us. 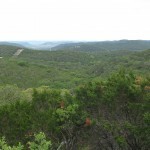 The weekend was wide open – I was cruising getaway airfares, contemplating different destinations – but we were also considering making a geocaching event south of San Antonio, so we had concentrated some attempts in that general direction. 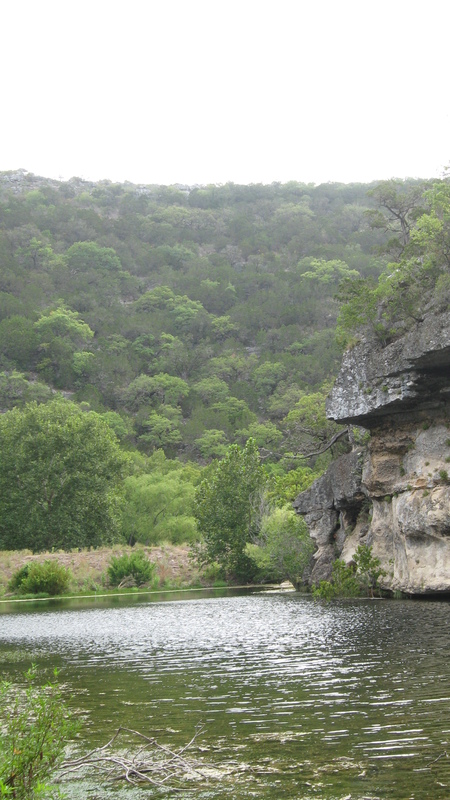 We also had some ideas about returning to Lost Maples State Park. We had been there last summer during this great road trip I have slowly been writing about, and promised ourselves we would go back. 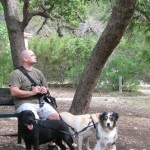 We were also very interested in finding a dog-friendly destination, as the dogs had been cooped up a lot lately. He asked me if I had “that list of cabins near Lost Maples” that he had sent me at some undetermined time last year, even though he was unsure if he sent it via email or during a chat session. 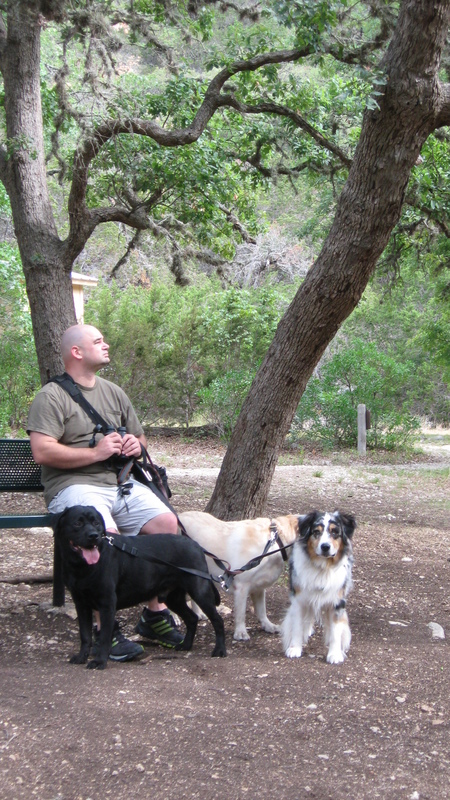 I had no idea what he was talking about, but was obsessively googling pet-friendly cabins near San Antonio and Lost Maples, and I found the website of something that sounded just like what we were interested in. I sent it to him over chat, and he says, “oh, you found it!”. Coincidence? 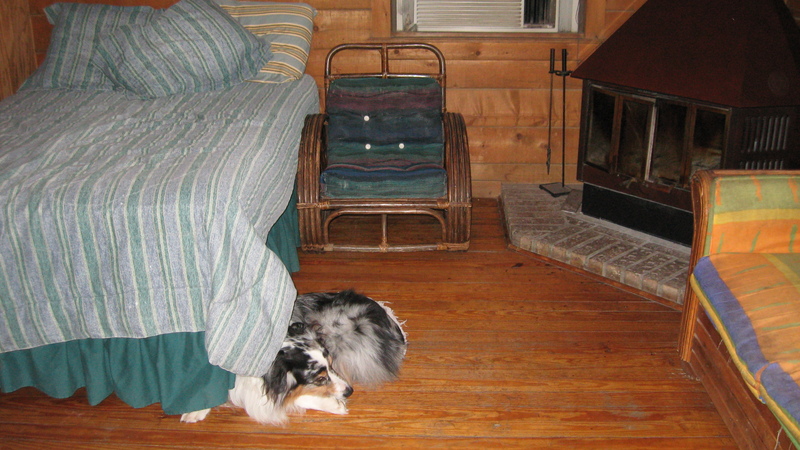 Or some kind of hidden meaning…whatever it was, I decided to go with it, and that is how we ended up at FoxFire Cabins for the weekend. After a long drive the night before after work, in which we saw at least two dozen whitetail deer along the backroads, we ate our breakfast, then hurried out for a morning hike in Lost Maples State Park. FoxFire is just one mile down the road from the park , so it was a short drive, but we had to do it almost twice because I forgot our Texas Parks and Wildlife Department passport. See, we’ve been working on this little geocaching challenge they got going on, where if you find the special cache hidden in each of the state parks, and prove it by marking your card with the special marker in each cache, and answer a question about an indigenous animal from the parks by using a clue card in each one, and then send the passport in when you have found ten of the twelve in each region, you can get a nifty coin and bragging rights. We finished the Houston region a few weeks back, and didn’t want to miss the chance to work on the Hill Country region. 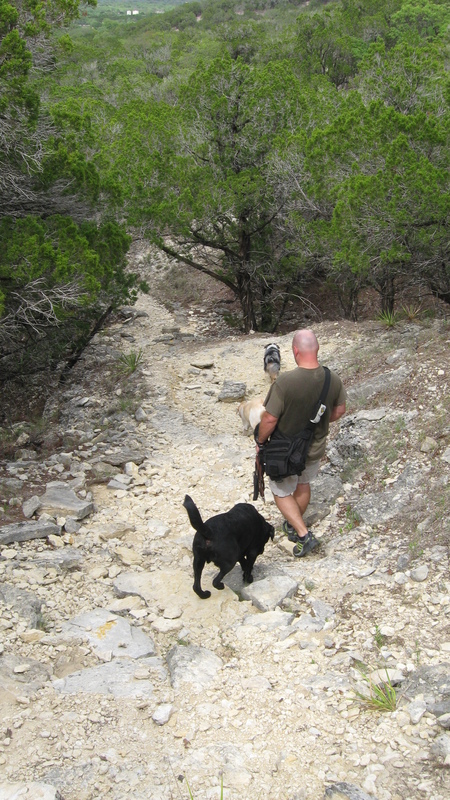 The hike to this particular cache in Lost Maples was about two miles round trip. Along the way, we had to cross several streams, which we remembered last year as being much higher. 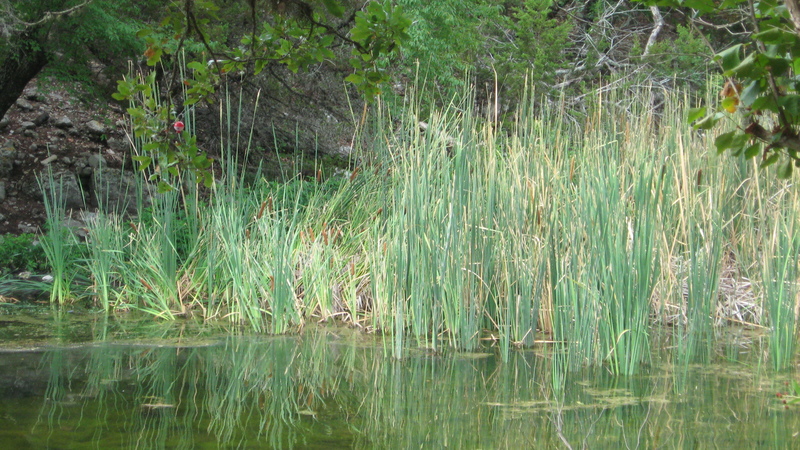 This area of Texas has been hit very hard with this year’s drought. We saw evidence of this all over the region. This park had more water than any of the other parks we saw, though. When we got to the “ponds” section, there was enough water in the pond to go swimming in, if you didn’t mind a marshy entrance. 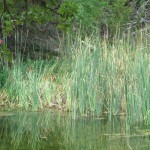 We saw little trickles of water along the creek banks. After we found the cache, we sat for a while on a bench near the ponds and watched the birds with the binoculars. There were several very large cardinals, males and females, flitting about. Two birds lingered in the branches above us, and were very curious and unafraid, even with our three dogs near our sides. They came within a few feet of us, watching us quizzically from the ground or branches right above us. After much discussion and comparison later, we determined that these were olive-sided flycatchers. After this pause for reflection, we walked back to the truck, then drove back to the cabin for lunch and brief lounging before getting back in the vehicle for more exploring. I will have to write about those adventures later, though. I have the cold nose of a dog nudging me to go for a walk, and my baby to snuggle, before my kids get home in a couple of hours. I hope to post more regularly soon about not only this trip, but the ones that came before it, and the ones that will come after.